Last week we had the opportunity to pay a visit to Villa Hemmet thanks to its owners' kindnenss. This villa is also located in Gamla Åkarp, not too far from ours and it is incredibly beautiful. We took this as a great opportunity to learn on how also other families have renovated their house and get some inspiration for ours. 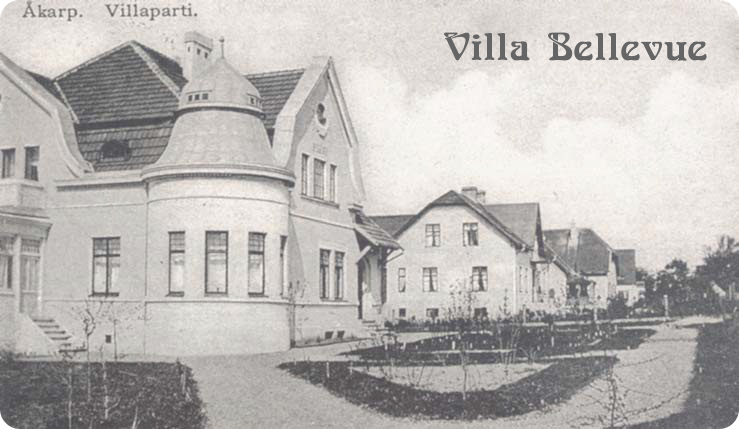 Villa Hemmet was built 1915, based on some drawings by an architect more accostumed to churches than villas. The current owner had the opportunity to meet Hans Ingemanson (who lived in our house when it was built) who defined Villa Hemmet as "the new one". Luckily, not so many owners have lived there and that has made it possible to preserve a lot of original details. There is a story behind this house: two sisters fell in love with the same farmhand. Some sources report that the one that was not so lucky in love decided to use the inherited fortune to build this house and move there, other sources instead that the one who had the chance on the man, built the house and moved there with him and a maid. In both cases, the maid inherited the house after the couple's death and after her the house was bought by a priest family. The house is full of very nice details. From the little niches on both sides of the entrance, to the kakelugnar (a tiled stove). What strucked us mostly was that the floors are original in most of the house and look very different from our pine tree floor, which is the "under floor"! On each threshold there were some metal bars with decorations. When looking at our threshold I can see that there are some "holes" and I wonder if such metal bars (I suppose to protect the wood to get consumed) were there as well. The owners have decorated the house with very beautiful wallpaper and site-built bookshelves that melt in between the original windows. Between the inner and the outer window, considering the season, they had put some material that would prevent drafts. That is a smart way to have a better indoor climate! It is not necessary to change such windows into modern ones! The presence of a little steep stair nearby the kitchen made us also realize that there must have been one like that in our kitchen too, to reach the maid's room, which was probably the room that today will be Oscar's. I had wondered many times about the pipes rests we found in that room and it is clear that the bathroom we have newly renovated didn't exist from the start. Their kitchen has been renovated with a checkboard floor and a new furniture in old style. It looked definitely more practical than ours and despite the years (about 10) in a much better state! They also renovated the maid's room, changing the planning of it, to a bathroom with the laundry facilities. It is a pity since the "maid stairs" now are the only way to the attic (and this is possibly an obstacle to use the attic as additional room) but on the other hand, the bathroom is comfortable and one doesn't have to go down to the basement to wash clothes. Very nice also the new banister on the balcony: as it is possible to see in the picture above, before it didn't exist, but the new one looks like it has always been there. Also Villa Hemmet has a veranda, quite similar to ours in style. The difference though is the access: there are additional windows between the adjecent room and the veranda. So, I went and looked at the drawings of Villa Bellevue from 1953 and saw that between our veranda and the "fireplace room" there was a door. And I think I know where the rests of some part of that construction are: in our attic, hopefully! We also visited the basement and noticed that one didn't have to be a dwarf to go around there, differently from ours! This gives me hope that it will be possible to fix the basement so that one can walk there without too many problems. The room that was absolutely breathtaking though was the dining room. Original wallpaper is still there from 1915 and looked very close to something that is called gyllenläder (Cuir de Cordoue/cordovan). On one side of the room, there is also a table with benches around three sides of it. Textile work typical from Skåne is decorating the wall just behind the sits. The whole room is a masterpiece! I couldn't stop to stare at details like the doors handles (although I think some have been changed during the years - there was some clear funkis one! ), or even the radiators (and the fact that the thermostat looked very old) and by being there, I got so many ideas and dreams on how villa Bellevue looked like and could still do!